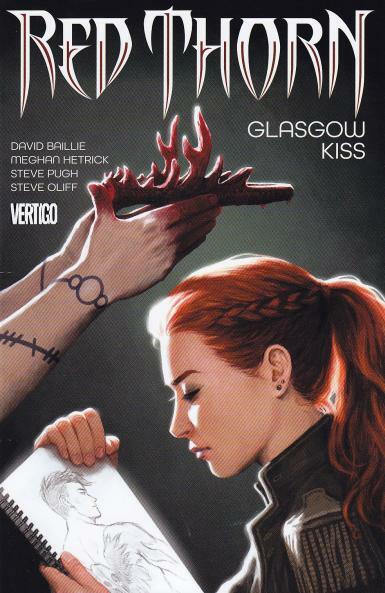 RED THORN Vol 1: Glasgow Kiss Review | Warped Factor - Words in the Key of Geek. 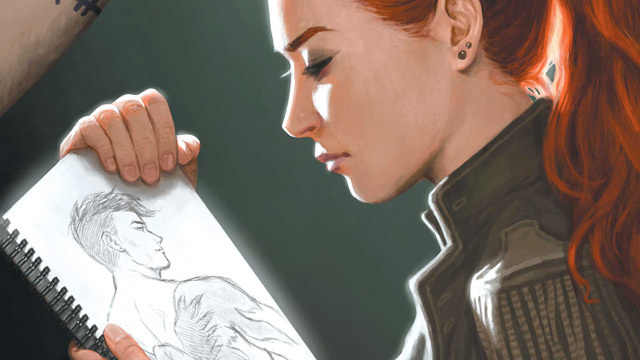 Gail Williams checks out the first collected edition graphic novel of Red Thorn. It rains in Glasgow - a lot. And Red Thorn #1 opens with an atmospheric graveyard scene with an inset of an emaciated figure in chains. With all the legends and stories of old Scotland, it’s a natural pull to an American, more so when the American is following in the footsteps of her sister; the sister who went missing nine and a half months before this American was born. Meet flame-haired Isla MacKintosh, she’s an unbelievable artist. The unbelievable bit is that her artwork comes to life - and apparently kills. Isla heads to Scotland looking for a life. She finds Alec, a sweet Glaswegian, and they go home to make “sweet music” together. As Alec sleeps, Isla gets a visit from a fish monster and seems surprisingly un-fazed, but there again, the monster does give her the first real clue to what happened to her sister. But that’s not the real problem, all through we’ve been seeing Isla’s drawings, and we know what happens to her drawings, they become real. And in this case, the real thing she’s been drawing is one of the old gods. The one we first saw inset in chains. Thorn. Well he’s still in chains, but now there’s flesh on his bones, and power in his muscles. With something to go on, Isla draws Alec a new her, and sets off in search of Thorn, heading for a place local folklore has it was Thorn’s seat of power - Red Cap Keep. There Thorn is resplendent on his throne. Still at least he saves Isla from being exsanguination by the Red Caps. Thorn tricks Isla into drawing the downfall of his oldest rival, one that in the reality the drawing she creates, dies 500 years ago. As Isla gets well and truly hammered, we see another place, Morocco, and another artist. This artist is a teenage boy, a mute, and he’s drawing maps, a map of Thorn’s Keep, Isla’s position in it marked. Things aren’t exactly going the way that Isla was hoping, Thorn’s busy making out with a group of groupies, but he is eager to manipulate her, all in the name of helping her find her sister. Thorn introduces her to the Stepping Orc and Franint, a female warrior orc, allowing Isla to travel the hundred miles back to Glasgow by passing through a single gate. What Isla finds isn’t what she wanted, Alec is getting on a little too well with Isla mark two. Thorn goes in another direction, looking for something else and we start to hear about Lord Cadros, Belatucadros. The rivalry between the two Gods is revealed. 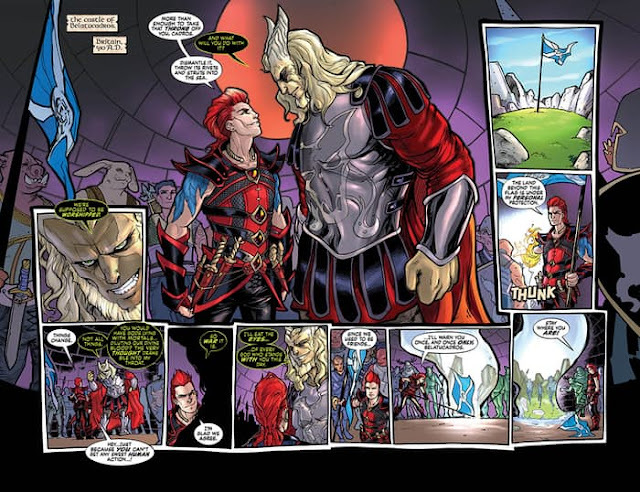 We also see Thorn heading for the Great Glen and meeting a very un-monstrous looking Nessy, a beautiful water nymph/goddess. As the volume starts to answer some of its questions, it makes us ask more too. Thorn is a demigod, but what does he really want? Besides shagging anything that moves apparently. Cadros might be evil, but is he worse than Thorn? Anyone else getting worried about the way Isla is drinking? We should be, and Cadros explains why. 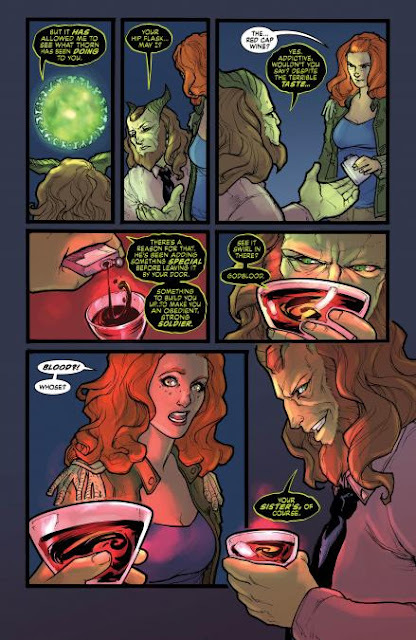 He tells Isla what happened to her sister and what Thorn has been dosing her drink with. His honesty is less frightening than Thorn’s deception, mostly because it uncovers Thorn’s deceptions. But honesty has a price, one Isla pays. What will happen as Isla breaks; wearing a straight jacket and locked in a cell of a very unsanitary looking sanatorium? So what do I think of this series - love it. It’s a good storyline that teases and doesn’t hold back. The artwork is great, even the artwork of the characters. It trickles in the ideas and information at just the right pace, and it keeps you reading. I’m very tempted to give this a five, but there are a couple of places where I just see issues with drawing. These aren’t big or off putting to the read, but they are just enough to knock this off the top slot (this is definitely me being very picky by the way because I don’t like giving out fives very often), which means of course that I’m giving this a very high four out of five (nearly a five).